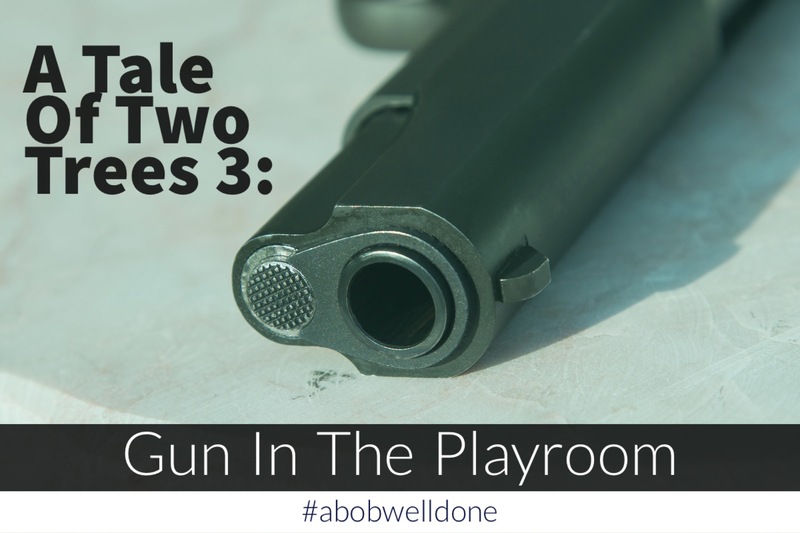 A Tale Of Two Trees 3: Gun in the Playroom – Stew Rd. You were born to be chosen. Think about that. Could it really be that is the entire reason you were born? Let’s look at the beginning. In Genesis 2, it says that God put Adam in a garden He had planted called, Eden. Adam was surrounded by beauty and provision at every turn. Everything was perfect. No conflict. No lack. No sickness. No violence, war, destruction or death. Toward the end of Genesis chapter 2, God brings all of the livestock he had created to Adam just to see what he would name them. I can just picture God with the Son, Holy Spirit and the angels almost giddy with anticipation waiting to see what Adam would name the massive animal with a hose of a nose, tusks and big ears. I can just see Father God turn to all watching as Adam chooses names. “ELEPHANT!!! Where does he get this stuff! I love it! You hear that, Jesus?” Father God is having a blast, maybe even creating a new animal on the other side of the garden just to see what Adam would call it. As far as we know, there was nothing in the garden that could harm Adam except one thing. In verse nine of Genesis 2, it says that there were two trees right in the middle of this utopian setting. One was called the Tree of Life and the other the Tree of the Knowledge of Good and Evil. From the information we have, there may not have been anything different about the Tree of Life from the other trees in the garden except for the one right beside it. The other trees produced fruit that was pleasing to the eye and nourishing to the body as well. Maybe that was the point? The fruit on the Tree of Life and the Tree of the Knowledge of Good and Evil may have looked the same. It may have been at the same height and level of accessibility, but the fruit from the Tree of Knowledge of Good and Evil carried a heavy price tag. If I were in charge of landscaping the Garden of Eden, I would have found the farthest, most remote and inaccessible place to plant that tree in hopes it would never be found. Not God. He could have put Adam and Eve anywhere on the earth but He chose to put them in a garden with a very clear option for the worst possible result. WHAT WAS HE THINKING?!!??!!? Who does that? If you had a gun, the last place you would put it is on the kids table in the playroom. What could possibly explain making the worst possibility so easy to choose? Maybe He should have just “forgotten” to water that Knowledge tree or something. Maybe, just keep Adam and Eve occupied with some more animals to name and a bumper crop of pears in back forty? That seems much more reasonable to me. But, what if safe was never the goal? What if there was something far more valuable than safe? IMAGINE THIS . . … imagine if you found your soulmate with looks and personality so great all you could do is talk silly around them. But, then imagine you had the social skills of a kidnapping dictator. That will set a girl’s heart on fire! Cue the wedding bells! You might as well just take the gun off the playroom table and point it at someone on the street you think would be a great marriage option and try the, “Marry me” approach. You were chosen, but what if you never had a choice? A Father wanted a family and a Son wanted a bride but without choice it would be nothing more than a relationship with an optionless puppet. The Chooser had to give us the option to choose or reject Him. Without full freedom to be chosen or rejected, they (Father and Son) would never have what they wanted most – reciprocated love chosen in the face of every possibility to be rejected for other options. The greatest prize required the greatest risk. Love was spelled R-I-S-K. Thank God for the Law! – The GPS directions back to “we”. What if? Me: Son, Husband to my dream girl, proud Father, Friend, Pastor-guy. View all posts by Stew Rd. Pingback: A Tale Of Two Trees 2: Born to be Chosen – Stew Rd. Pingback: A Tale Of Two Trees: Intro – The Day I Didn’t Shower – Stew Rd.